As a parent, few things are cuter than your full-cheeked baby or the chubby knees of your toddler. For some children, however, that adorable baby fat may turn into a health concern. If you’re watching your child struggle with his or her weight, you may feel alone or helpless; in reality, you are neither. Childhood obesity affects an enormous and growing number of families around the world, but the vast majority of these cases are preventable—and can still be reversed. With support, encouragement, and positive role modeling, you can help your child reach and maintain a healthy weight. Over the past 30 years, the number of kids with weight problems has increased at an alarming rate. Today, 1 out of 3 children and teens in the U.S. are overweight or obese. Those extra pounds put kids at risk for developing serious health problems, including diabetes, heart disease, and asthma. Childhood obesity also takes an emotional toll. Overweight and obese children often have trouble keeping up with other kids and joining in sports and activities. Other kids may tease and exclude them, leading to low self-esteem, negative body image, and even depression. 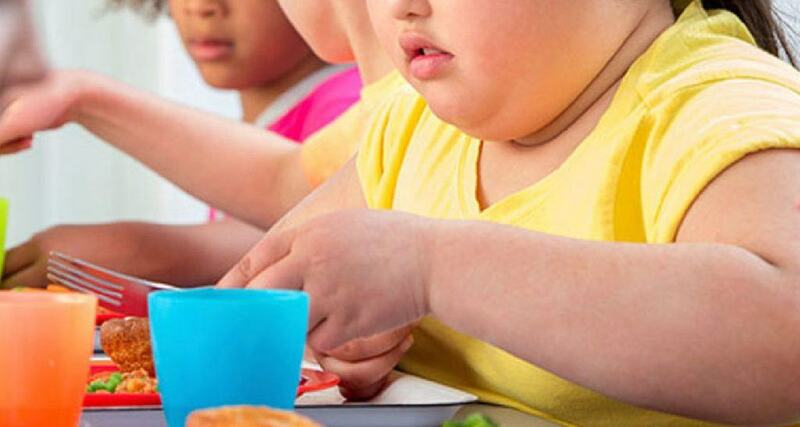 Diagnosing and treating weight problems and obesity in children as early as possible may reduce the risk of developing these and other serious medical conditions as they get older. Whatever your children’s weight, though, let them know that you love them and that all you want to do is help them be healthy and happy. Children grow at different rates at different times, so it is not always easy to tell if a child is overweight. Body mass index (BMI) uses height and weight measurements to estimate how much body fat a child has, and can be used to screen for weight and obesity problems from the age of 2. However, while BMI is usually a good indicator, it is NOT a perfect measure of body fat and can be misleading in some situations. For example, BMI can be difficult to interpret during puberty when children are experiencing periods of rapid growth. If your child registers a high BMI-for-age measurement, your health care provider may need to perform further assessments to determine if excess fat is a problem. These assessments may include skinfold thickness measurements, plus evaluations of diet, physical activity, family history, and other appropriate health screenings. The doctor may also decide to screen for some of the medical conditions that can be associated with obesity. Understanding how children become obese or overweight in the first place is an important step toward breaking the cycle. Most cases of childhood obesity are caused by eating too much and exercising too little. Children need enough food to support healthy growth and development. But when they take in more calories than they burn throughout the day, the result is weight gain. Busy families are cooking less and eating out more. Food portions are bigger than they used to be, both in restaurants and at home. Kids are consuming a huge amount of sugar in sweetened drinks and hidden in an array of foods. Kids spend less time actively playing outside, and more time watching TV, playing video games, and sitting at the computer. Many schools are eliminating or cutting back their physical education programs. Healthy habits start at home. The best way to fight or prevent childhood obesity and weight problems is to get the whole family on a healthier track. Making better food choices and becoming more active will benefit everyone, regardless of weight. And with the whole family involved, it will be much easier for your overweight child to make lasting changes. The most effective way to influence your child is by your own healthy example. If your children see you eating your vegetables, being active, and limiting your TV time, there’s a good chance that they will do the same. These habits will also have the happy side effect of helping you maintain a healthy weight. Think about the immediate benefits. If reducing the risk of future heart disease seems abstract, focus on the good things that can happen right now. You won’t feel uncomfortably full if you have a smaller portion or skip dessert. Going hiking with your teenager might lead to a wonderful talk that neither of you anticipated. A fruit salad tastes great and looks beautiful. Dancing or playing with your kids is lots of fun and can give you a great workout. Make small, easy changes over time. Suggesting that family members take a run together every day will probably get you lots of eye-rolling and “no-thank-you’s.” It’s easier and more appealing to start out with some new approaches to nutrition and physical activity that the whole family is really willing to try. For example, take a walk after dinner a couple of nights a week instead of turning on the TV. And, instead of chocolate cake with frosting, enjoy sliced strawberries over angel food cake. Begin eating right today, as a family. Remember the importance of role modeling: there should be emphasis on what you do so that your child can follow. It is crucial to get the whole family in on the idea of eating healthily at home and away. Helping your child beat obesity begins with helping him or her forge a healthy relationship with food. You may need to make major changes to your eating lifestyle. Look for hidden sugar. Reducing the amount of candy and desserts you and your child eat is only part of the battle since sugar is also hidden in foods as diverse as bread, canned soups and vegetables, pasta sauce, margarine, instant mashed potatoes, frozen dinners, low-fat meals, fast food, and ketchup. Your body gets all it needs from sugar naturally occurring in food—so anything added amounts to nothing but a lot of empty calories. Check labels and opt for low sugar products and use fresh or frozen ingredients instead of canned goods. Limit dining out. If you must eat out, avoid fast food if you can and make the healthy choices you are trying to make at home. For years, nutritionists have preached that a low-fat diet is the key to managing weight and preventing health problems in kids and adults alike. But not all fats contribute to weight gain. So instead of trying to cut out fat from your child’s diet, focus on replacing unhealthy fats with healthy fats. When cooking for you and your child, choose your oils carefully. Cold-pressed oils such as extra virgin olive oil, sesame oil and peanut oil are rich in healthy fats. The same may not be true of modern processed oils such as soybean oil, sunflower oil, corn oil, canola oil, cottonseed oil, safflower oil and vegetable oil. These oils are industrially manufactured—usually from genetically modified crops in the U.S.—using high heat and toxic solvents to extract the oil from the seeds. Many experts recommend sticking to cold-pressed oils or using butter or ghee (clarified butter) for cooking and baking. Not all saturated fat is the same. The saturated fat in whole milk, coconut oil, or salmon is different to the saturated fat found in pizza, French fries, and processed meat products (such as ham, sausage, hot dogs, salami, and other cold cuts) which have been linked to heart disease and cancer. Despite the saturated fat content, kids who eat whole-milk dairy products tend to have less body fat and lower levels of obesity than those who eat skim or non-fat dairy. This may be because the saturated fat in whole milk dairy makes kids feel fuller, faster, and keeps them feeling satisfied for longer, thus helping them to eat less overall. Adding a small amount of butter or olive oil to vegetables will not only improve the taste but can be far more satiating to kids. To help your child make healthier choices, focus on the source of saturated fats consumed: A glass of whole milk or natural cheese rather than a hot dog, donut, or pastry, for example, grilled chicken or fish instead of fried chicken, or a 4 oz. portion of grass-fed beef rather than a burger and fries. Avoid saturated fat from processed meats, packaged meals, and takeout food. Don’t replace healthy sources of saturated fat with refined carbs or sugary snacks. Don’t eat just red meat (beef, pork, or lamb) but vary your child’s diet with chicken, eggs, fish, and vegetarian sources of protein. When you choose to serve red meat, look for “organic” and “grass-fed” to avoid antibiotics, growth hormones, and GMOs often found in industrially raised meat. Roast, grill, or slow cook meat and poultry instead of frying. Allow your child to enjoy full-fat dairy and choose organic milk, cheese, butter, and yoghurt whenever possible. Avoid snack foods such as corn or potato chips. For more on good fats and bad fats, see Choosing Healthy Fats. 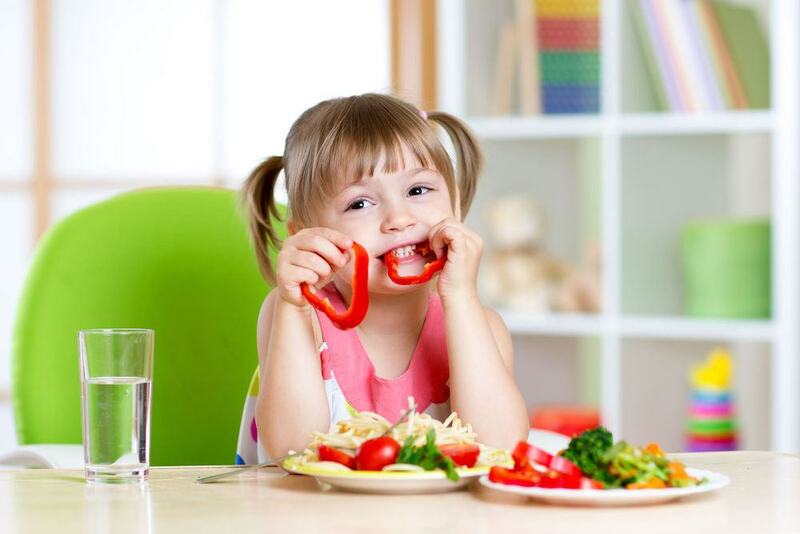 Your home is where your child most likely eats the majority of his or her meals and snacks, so it is vital that your kitchen is stocked with healthy choices and treats. Don’t ban sweets entirely. 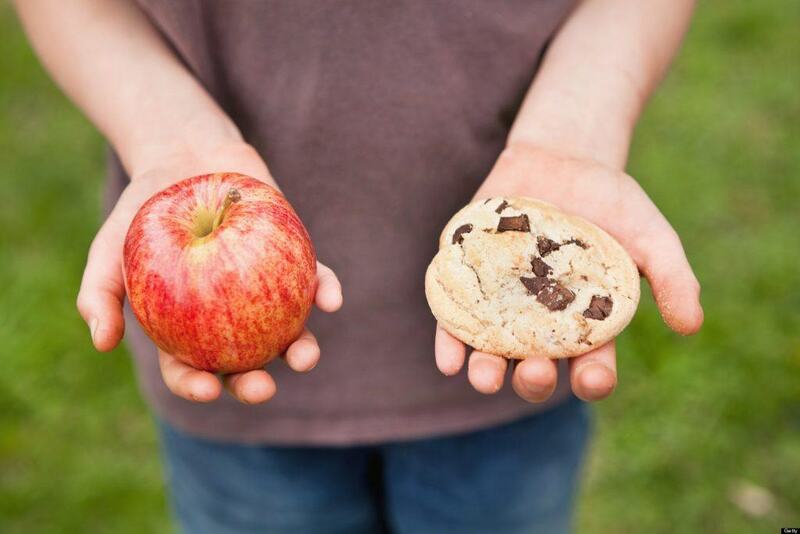 While many kids’ sugar consumption exceeds healthy limits, having a no sweets rule is an invitation for cravings and overindulging when given the chance. Instead, limit the amount of cookies, candies, and baked goods your child eats and introduce fruit-based snacks and desserts instead. Limit juice, soda, and coffee drinks. Soft drinks are loaded with sugar—“empty” calories that don’t do anything healthy for your child’s growing body. Shakes and coffee drinks can be just as bad. Many juices aren’t any better nutritionally, so encourage your child to eat a piece of fruit instead—kids love satsuma or tangerine oranges. Instead of soda, offer your child sparkling water with a twist of lime, fresh mint, or a splash of fruit juice. Focus on fruit. Keep a bowl of fruit out for your children to snack on. Offer fruit as a sweet treat. Kid-friendly favorites include frozen juice bars, fruit smoothies, frozen bananas dipped in chocolate and nuts, strawberries and a dollop of whipped cream, fresh fruit added to plain yogurt, and sliced apples with peanut butter. Check the sugar content of your kid’s cereal. There’s a huge disparity in the amount of added sugar between different brands of cereal, even those proclaiming to be whole grain or high in fiber. Some cereals are more than 50% sugar by weight. Try mixing a low sugar, high-fiber cereal with your child’s favorite sweetened cereal, or add fresh or dried fruit to oatmeal for a natural sweet taste. Fresh fruit and vegetables that can be taken on the go or packed in a lunch. Soda, sweetened lemonade, fruit punch, and fruit juice with added sugar. Whole milk and dairy products, including string cheese. Hot dogs, fatty lunch meats, sausage, chicken nuggets. Whole grain breads and cereals, pretzels, nuts, olives. White bread, sugary breakfast cereals, chips. Greek yogurt, frozen fruit juice bars, fig bars, ginger snaps. Cookies, cakes, candy, ice cream, donuts. Learn what a regular portion size looks like. The portion sizes that you and your family are used to eating may be equal to two or three true servings. Limit portions to the size of your fist. Downsize orders. When eating out, share an entrée with your child or order an appetizer instead. Order half-orders or a medium size instead of a large. It used to be commonplace to find children running around and playing in the streets of their neighborhoods, naturally expending energy and getting exercise. In today’s world, that’s not always an option. If you’re not comfortable letting your children roam free, you still have options for boosting their activity level. Try activity-based video games, such as those from Wii and Kinect which are played standing up and moving around—simulating dancing, skateboarding, soccer, bowling, or tennis. Once you child gains in confidence, get away from the screen and play the real thing outside. Sign up for a 5 or 10K walk/run with your child. Sometimes having a goal in mind can motivate even the most reluctant exercisers. Find a kid-friendly walk/run “race” in your area and tell your child you’ll be “training” for it together. Be sure to celebrate when you accomplish this feat. The more time your children spend watching TV, playing video games, or using computers or mobile devices, the less time they’ll spend on active pastimes. Limits on television and computer time lead directly to your child spending more time being physically active. Remember how important it is for you to be a positive role model—yes, you may have to cut down on your own viewing habits—and have a good attitude about the change. You can make a huge impact on your children’s health by being involved with the details of their lives. Talk to your children. Ask them about the school day, every day. Listen to their concerns and take action if there is something they need. Be in touch with teachers. Speak to your child’s teachers, especially P.E. instructors, either in person or on the phone. Defy busy schedules. You may feel like neither you nor your child has time for long chats about the day. This may be the toughest lifestyle change to make, due to busy schedules, but it can be done. If you need to, treat getting involved like another appointment or meeting in your day. Spend time with your children. You don’t have to spend all your time having heart-to-hearts. Playing, reading, cooking, or any other activity, when done together, can supply your child with the self-esteem boost he or she may need to make positive changes. 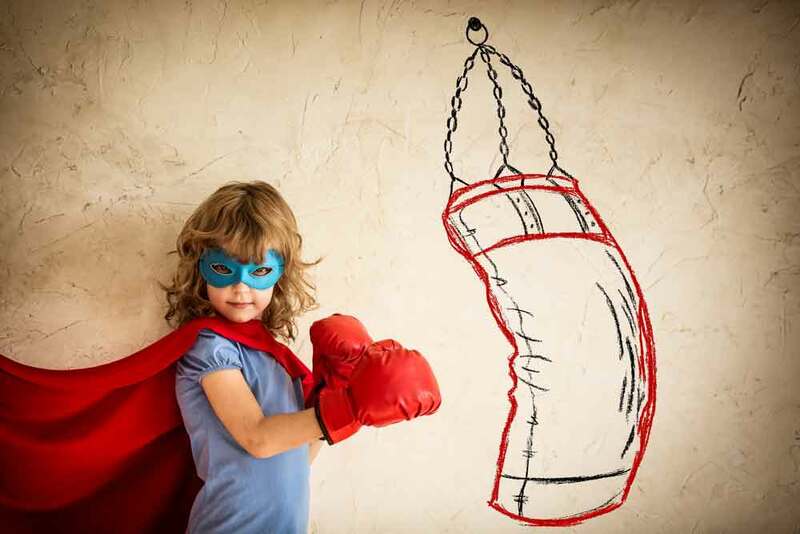 There are no easy options when it comes to tackling childhood weight problems and obesity. Weight-loss surgery and medications are rarely recommended for children and adolescents. If you have changed your family’s eating and physical activity habits and your child has not reached a healthy weight, or if your doctor determines that your child’s health or emotional well-being is at risk because of his or her weight, you may want to consider a weight-control program. Depending on your child’s BMI, age, and health, your doctor may refer you to a registered dietitian, psychologist, and/or exercise physiologist for additional guidance on healthy eating, physical activity, and weight control. Again, any treatment program should address healthy eating and physical activity habits for your entire family. Next articleDid You Know That Vitamin D Help You Lose Weight?